Life’s not always a fairytale when you are a witch, especially in a world that is full of suspicion. 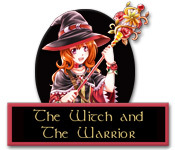 Explore this magical world in The Witch and The Warrior! An uncomfortable truce is only just forming between the magic and non-magic folk after years of war, but the message is spreading slowly. Experience the trials of a teenage witch in this fun and exciting Strategy game.